Draw banking system flowchart with professional flowchart software. Lots of examples and templates help you start right away. Are you puzzled about various banking systems and do not know the exact process of each system? This article will introduce the banking system and take one of systems as an example to draw a flowchart for you. Hope it will enable you to have a better understanding about banking system and banking system flowchart. Banking system is a principal system who provides various financial systems for people, including accepting deposit, providing loans and credit, withdrawing and transferring money and investing facilities. Banking system flowcharts are flowcharts mainly based on banking systems such as depositing system, withdrawing system, loaning system etc. This flowchart describes the flow of data in a banking system and aims to show the different systems more clearly. Let’s take depositing system as an example to show you what is banking system flowchart visually and how to draw it. Step 1 Make yourself clear about the detailed steps about how to deposit money, including what documents you should prepare before and who will be in charge of each step. Step 2. Start drawing banking system flowchart with a professional flowcharting program. A professional flowcharting program should be a program which has settled everything ready and you do not need to do much. You just need several drags-and drops, and then a beautiful and clear banking system flowchart comes out. Flowchart Maker is exactly the flowcharting program i am talking about. It is a commendatory flowcharting program with various built-in flowchart symbols and pre-made flowchart templates. It is very easy to use, no matter you are a novice or an experienced flowchart designer, you only need a few clicks to drag and drop some symbols and templates, then you will get an attractive banking system flowchart. Here is also a flowchart example for your reference. Besides flowchart, data flow is also an effective tool to show processes within a system. It's used to show how data is processed by a system in terms of inputs and outputs. 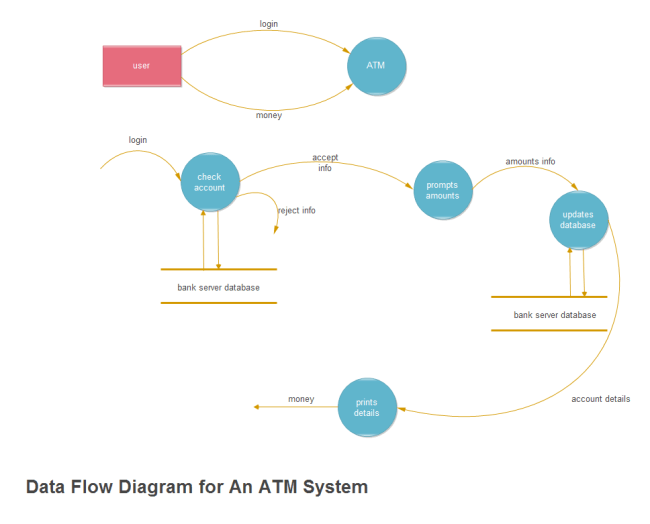 Below is an example of bank ATM system data flow for your reference.